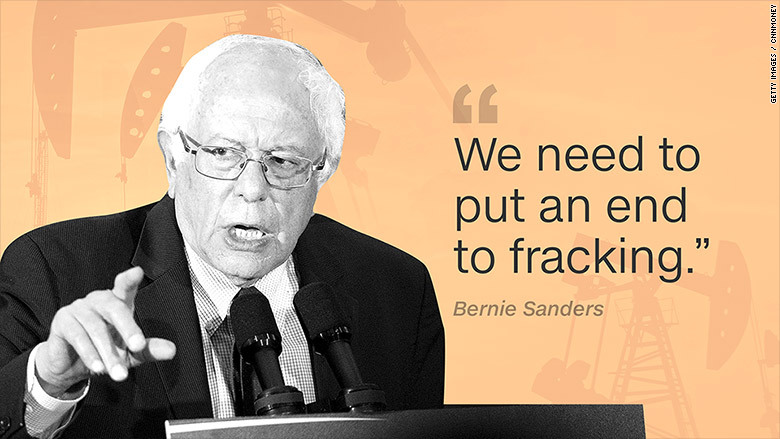 If Bernie Sanders becomes president, America's fracking boom will be in danger. This week the Democratic presidential candidate called for a national ban on fracking, the controversial drilling technology that has not only led to a massive boom in oil and natural gas, created thousands of new jobs but also been linked to water contamination and even earthquakes. "If we are serious about combating climate change, we need to put an end to fracking, not only in New York and Vermont, but all over this country," Sanders said during a speech in Binghamton, New York this week. The anti-fracking crusade marks an escalation for Sanders, who previously introduced legislation to ban fracking on federal lands. It also pressures his rival, Hillary Clinton, to endorse a fracking ban, which is something Vermont and New York have already done. "Fracking pollutes water, degrades air quality and worsens climate change. No amount of regulation can make it safe," Sanders said on Twitter. Environmentalists cheered the Sanders fracking ban proposal, but others are worried about the consequences for the economy and national security. After all, the energy boom helped lead America out of the Great Recession, thanks largely to fracking, which now accounts for half of all U.S. oil production. New oil and gas extraction alone created 725,000 U.S. jobs between 2005 and 2012, lowering the unemployment rate by 0.5%, according to a 2015 study by Dartmouth professors. Fracking has also been a boon to consumers, with excess U.S. supply causing oil prices to crash to $26 a barrel earlier this year. The average American family saved an estimated $750 last year on cheaper gas prices. It's reasonable to conclude any ban on fracking would raise oil and gas prices. A fracking ban would also darken the already-troubling employment picture in the U.S. energy industry, which has slashed thousands of jobs. "Slamming the brakes on fracking now or in the future would be extremely damaging," said Sheila Hollis, a partner and energy specialist in the law firm Duane Morris. The American Petroleum Institute, which represents big oil and gas producers, told CNNMoney the Sanders proposal is mere "fear mongering." Certain communities in Western Pennsylvania and Ohio are enjoying "economic growth for the first time in a generation" thanks to fracking, according to Louis Finkel, executive vice president for government affairs at API. Fracking has also made America less reliant on oil from unfriendly countries in the Middle East. U.S. oil production has nearly doubled over the past decade and now only trails the world's top producers: Saudi Arabia and Russia. However, there are real environmental concerns over fracking. Environmental worries were highlighted by a 2010 HBO documentary called "Gasland" that focused on residents who have experienced chronic health problems traceable to contamination of their air and their water from fracking. Last month government scientists warned that 7.9 million people are now at risk of earthquakes believed to mostly be triggered primarily by the disposal of waste water as part of oil and gas drilling. Fracking involves shooting a mixture of mostly water and sand under high pressure against a rock formation until it fractures. The sand fills the fracture, oil and gas out of the rock formation. Also renewable sources of energy like solar are not yet ready to carry the torch. Even the U.S. Energy Information Administration forecasts that fossil fuels will supply the vast majority of U.S. energy until at least 2040. The Independent Petroleum Association of America told CNNMoney that any attempt to "stifle" the U.S. oil and gas industry "is not only misguided but impractical policymaking." The anti-fracking crusade by Sanders is putting pressure on Clinton, who has stopped short of endorsing an outright ban on fracking. This week Sanders said the recent Keystone oil pipeline leak shows why he was against the Keystone XL pipeline extension from the beginning. He has criticized Clinton as being late to oppose the controversial project. Sanders also put out a new ad narrated by Susan Sarandon trumpeting him as the only presidential candidate opposed to fracking everywhere. The ad claims Washington politicians "side with polluters over families" because "big oil pumps millions into their campaigns." Clinton doesn't sound like a friend to frackers either though. In last month's CNN debate in Flint, Michigan, Clinton said she doesn't support fracking in states that don't want it, if it causes pollution or if the chemicals used aren't disclosed. "By the time we get through all of my conditions, I do not think there will be many places in America where fracking will continue to take place," Clinton said.